Today's WOW guest, Gina Damico, grew up under four feet of snow in Syracuse, New York. She received a degree in theater and sociology from Boston College, and has since worked as a tour guide, transcriptionist, theater house manager, scenic artist, movie extra, office troll, retail monkey, yarn hawker and breadmonger. 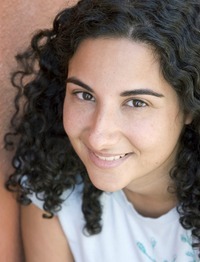 Croakis her first novel, and its sequel, Scorch, comes out in September. She lives in Boston with her husband, two cats, and a closet full of black hoodies. You can find her at www.ginadami.co, on her blog, or on Twitter. Credentials. The word loomed over me like a giant knife-wielding grizzly bear. At night. On the edge of a precipitous cliff. Okay, I may be exaggerating a little, but the sentiment is the same: when I first began my attempt to break into the writing world, I had this idea in my head that I would never get published - no matter how good my stuff was - unless I had a giant scroll that would unfurl to list my many master's degrees, publications, awards, the Nobel Peace Prize, and an Official Subway Sandwich Artist certification. Because back when I attended my first workshop, there were people there who had such things. (Okay, maybe not the Subway certificate.) They'd already been published. In respected literary magazines. You know what I had been published in? My local library's digest of children's writings, when I was five. It was a haunting tale of two rabbits who become friends, then one of them gets shot and dies. The only thing it earned me was a pat on the back, a couple of raised eyebrows, and some whispered exchanges between my parents about whether a child therapist was in order. And by the time I got it in my head that I wanted to be a writer, it was still the only credential to my name. I'd never written anything else of substance besides my manuscript. I hadn't attended any workshops or conferences, or won any prizes. I hadn't even majored in English in college. Yet all the research I had done on how to write a good query letter included that same daunting instruction: be sure to note your credentials. Turns out you never quite realize how much white space a 8.5"x11" paper really has until you are desperately, desperately trying to fill it with something of importance. I didn't have importance. Here's what I did have: I wrote two scripts for my student-run murder mystery theater group in college, and I was a freelance blogger for a bawdy-titled television website. Which are both perfectly acceptable things to include in a query letter, provided you want your potential agent to snort coffee out all over it, and then pin it up onto the office bulletin board so that all of the other agents can spit coffee onto it as well. And back at that first workshop I attended, the credentials thing was mentioned once again. It was the sort of conference that offered the opportunity to pitch my book to potential editors, so I was doubly terrified. What was I supposed to say? "Hi. I wrote a book. It's a YA, and it's about Grim Reapers, which is pretty cool, I think. What's that? What have I written before? Well, I've polished off a couple of very impressive evites, and the thank-you cards I wrote for my wedding were touted by many as 'adequate'. Excuse me? Security has been called? Well, thank you for your time. I'll show myself out." But here I am, writing a guest post as a published author. And do you know why that is? Credentials aren't necessary. Can they help? Absolutely. But can you also get published without them? Absolutely. Check out my bio down there. Those are the paltry ingredients I had to work with, and yet, somehow, it happened for me. Agents and editors aren't looking for a laundry list of your accomplishments. If you have some, then by all means, sing them all the way to the top, just like that little yodeling guy on The Price is Right. But if you don't, I beg you, please do not let this discourage you. What agents and editors want is your talent, not your résumé. If it's not your thing, don't go to grad school for a degree in creative writing just because you think it'll catch an agent's eye. If it's not your thing, do not waste your time trying to write short stories just so you can get them published in a magazine. If it's not your thing, don't start a book blog just to make yourself more appealing to sales and marketing. Write what you want to write. Don't write what you're supposed to write. Now, I will readily admit that I am only speaking from my own experience. And I don't want to make it seem like it's the simplest thing in the world to get published, credentials or no - it's not. At all. And if any of those things appeal to you and are roads that you truly want to take on the publication journey, by all means do them. I know writers who have gone to grad school, been published in journals, become bloggers - and they all think their respective experiences were better than pie. So if those things are your bag, go for it. Just don't do them for the wrong reasons. Because the point is: even if your résumé is sparse, you still have a chance. Don't be scared off by those who seem more experienced. Don't give up because you don't have that killer byline. DO, however, make sure your manuscript is the best that it can be. Let others read it, get their feedback, and listen to that feedback. Revise until your eyes fall out and your fingers fall off. Make it good, and your tumbleweed-ridden bio will cease to matter. Because it was at that very workshop, amidst all the other participants, some of whom did have lofty credentials to their name, that I got my first manuscript request from my future agent. And it's because she liked my idea - not my degrees, awards, or sandwich artistry skills. Great points Gina. I think it's a bit like any first job. Whatever experience that relates to being a writer helps but like a first job, you have to start somewhere and that's often without credentials. Thanks for sharing your insight. I think lack of credentials scares many writers from taking the next step. We have to remember that everyone starts somewhere with nothing to put behind their name! Great post and congrats on your books! Good advice! I teach a lot of beginning writing students, and I usually tell them to include any experience that is relevant (writing or life experience), but if they don't have anything, just skip that section. Better to not have the bio paragraph than to have a lot of random, irrelevant stuff that won't make a good impression.